Found the info on Facebook. 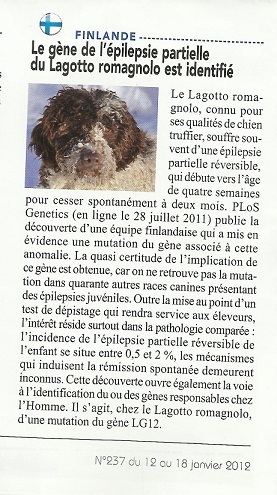 This is very exciting because this team in Finland has already found the marker for the Lagotto. They are working with the CNRS in Rennes, France. Hopefully, they will soon be able to identify it in what makes up a Barbet around the globe. More then reason to send all blood samples to a same place! There were not enough samples a while back, and that is a shame. There are the same diseases in all breeds and no one is exempt. Despite the fact that a pedal boat captain and his first commander in chief have told you that all the info is on the club website, and it isn't(nothing new)...here are the steps to getting it done. Fill in a sheet for each dog who will participate in Symposium. One sheet for meals so if you do it on net plus1€; You can sign up for lunch or dinner or both. Put the names, addresses etc because they are for the catalog. 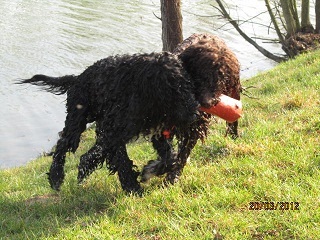 THEN IF you want to do club specialty, on the same day ( Barbet judging will be first, so we don't have to stand around and wait) go to Natioanle d'élevage chiens d'eau and sign up dogs you want to show and Pay.It's cheaper if you are a member of the club. IF you don't have an account you can create it.Pay with a credit card. All my dogs are doing the symposium, but not all the NE/ Specialty show. Novaforesta Dudley is the son of Caya de la serve de la Chapelle d'Alexandre, so more births in the line! Bravo Caya!!! Congratulations to Ebène, the mom!Of course we hope they are doing well! French and Booly Wooly making sure they didn't drop the dummy.You never know.Had it been Floirac, Booly Wooly being the gentleman he is would have let her have it!